We’ve always known our cases are protective, but one customer’s story shows just how strong they really are. Damon Reed from Mt. Sterling, KY sent in a truly astounding story of what happened when a bullet hit his son Anthony’s iPhone in a CandyShell Clear case. Anthony was driving to get something eat when someone fired a bullet that hit his car on the driver’s side. 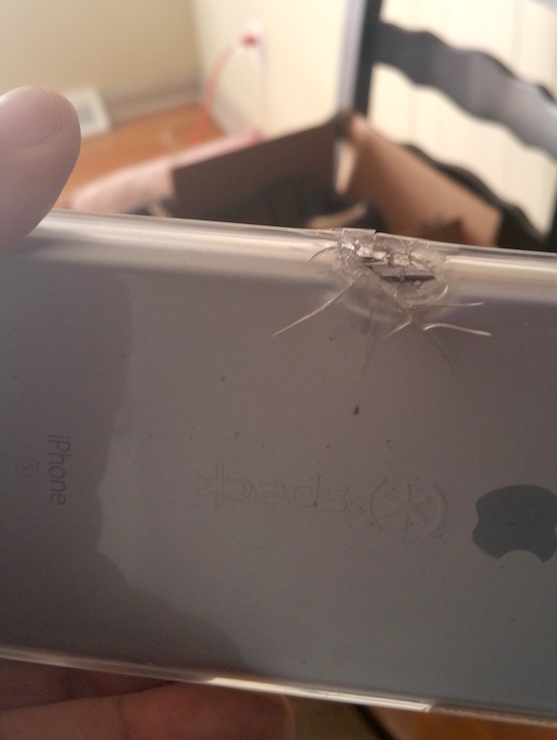 According to his account, the bullet collided with Anthony’s iPhone 6 Plus, which had a CandyShell Clear case on it. From the pictures above and below, you can see the bullet hit the side of the case and phone, which took the brunt of the damage. Anthony came away with only minor injuries, and Damon says the case prevented more serious damage. We’re amazed at Damon and Anthony’s story. Do you have any stories to share about how Speck cases have saved your phone? Comment below, or reach out to us on Facebook, Twitter, or Instagram!